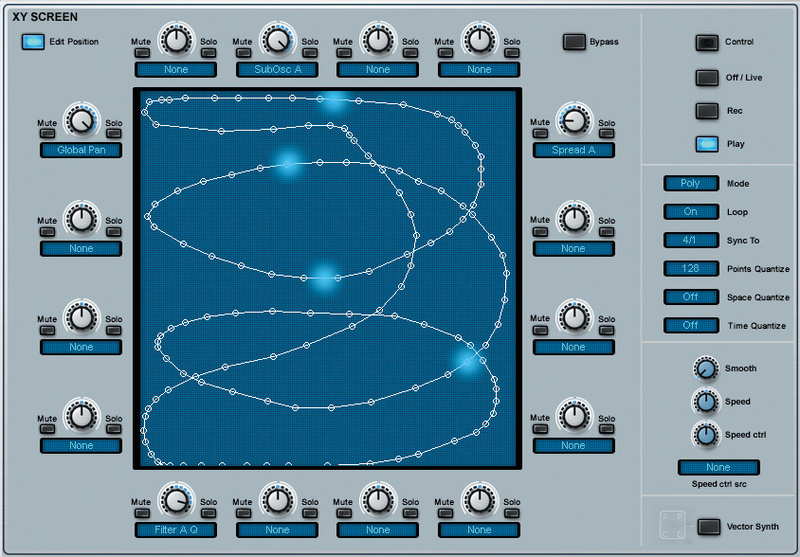 Rob Papen's venerable soft synth gets a comprehensive update. 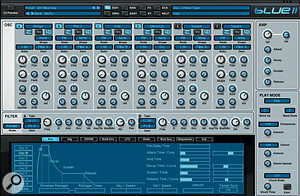 The original Blue soft synth was launched back in 2005, since when the Rob Papen product line has grown to include Predator, Blade, SubBoomBass, Punch, RG and PunchBD virtual instruments, as well as RPVerb, Delay, Distort and Amod effects plug-ins. 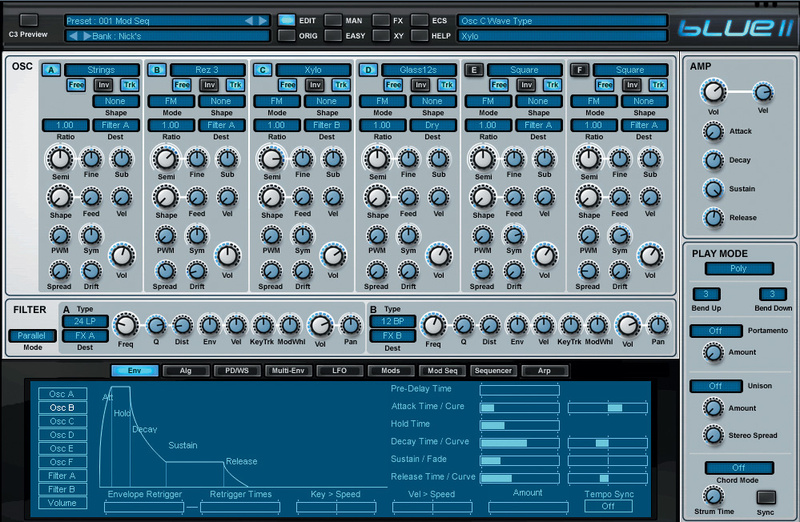 Blue continues to be one of my favourite soft synths, being able to produce sounds of enormous depth, detail and animation, using a method Rob Papen calls 'cross-fusion synthesis'. FM, phase distortion, wave-shaping and subtractive synthesis all combine within the one instrument, using six oscillators that can be routed to interact with one another using 32 possible configurations, or Algorithms. It may sound complex, yet Blue is surprisingly easy to use. It seemed hard to imagine what Rob could add to enhance Blue's capabilities, but enhance them he has, with this significantly expanded version, Blue 2. Both versions are based around the same core concepts, and these are described in detail in the original January 2006 Blue review which can be found at /sos/jan06/articles/rpcxblue.htm. In this review we'll look at what's been added or otherwise expanded upon. The first thing that becomes apparent is the size of the GUI; Blue 2 is bigger, with several changes to the layout. Firstly, the number of tabbed pages on the lower half of the GUI has been reduced from 12 to nine. The Sequencer and Arpeggiator now have dedicated tabs, whilst the old Global tab has gone, its functions split up and reassigned to other locations. Blue 2's main screen, with the ENV tab selected in the lower pane, currently showing the envelope for oscillator B. The old Presets, Easy and FX tabs have been relocated to the upper strip panel. This panel is also home to four displays; the two on the left show the selected Preset name and Preset Bank. The two on the right update as you move the mouse around the controls, showing parameter names and values. The Edit button lights up whenever a Preset has been edited, in which case the Orig (compare) button becomes active, and you can toggle these buttons between the edited and original versions. The number of Presets and Banks has grown dramatically since Blue and the 'Man' (formerly Presets) button gives over the bulk of the GUI to display them in an easily navigable format. Right-clicking parameters presents the option to directly 'latch' them to MIDI controllers; the Esc button opens a dialogue where you can save or load directly latched assignments for later recall — handy if you regularly use specific MIDI assignments for certain tasks. Tired of rooting around your hard drive for the PDF user manual? It's just one convenient click away on the Help button. The XY button invokes Blue 2's powerful new vector page feature, which we'll visit in more detail later. The last change to the layout is the addition of two panels on the right; the upper Amp panel knobs control Blue 2's overall volume and response to velocity, with ADSR knobs for the global amplitude envelope. These controls duplicate the same Volume parameters found on the ENV tab on the lower panel. The lower-right Play Mode panel controls key modes, portamento, unison and chord memory functions previously found on Blue's old Global tab. The oscillator section has grown to accommodate extra controls; all six Blue 2 oscillators (as opposed to only two on Blue) are now capable of PWM, and all are equally endowed with the same additional knobbage, comprising three new controls. Sub is a mixable sub-oscillator, with a choice of sine or square waveforms according to which direction the knob is turned. Spread, when set to a value other than zero, adds oscillators to the main oscillator, giving a unison effect. Higher values increase the detuning between the oscillators, which is ideal for making trance lead sounds or dense pads with just a single oscillator. For that authentic vintage vibe, Drift controls the amount of subtle pitch irregularities typical of older analogue synths. The Sequencer tab, showing the new Wave page. Oscillators A and B are each playing different waveforms on every step, looping around a 12-step sequence.Not so visibly obvious is the considerably expanded waveform menu. All the original Analogue, Additive and Spectral waves are there, joined by 315 sampled waves (if I counted correctly) split up into nine groups: Samples A & B, Tuned Percussion, Percussive A, B & C, Samples ST (stereo/stacked) A & B, and Samples ST Big. This takes Blue 2 into territory rather reminiscent of the Roland D50; in fact the bottle blows, bells, glass and metallic hits are highly suggestive of that venerable synth. There is one major difference: this is not the memory-challenged 1980s, so unlike the very short PCM samples of the D50, these have proper length. Percussives decay naturally, many waves are either stereo, multisampled, velocity switching or all of these, and sustained samples (including some very decent stereo choir and string sounds) have commendably inconspicuous loops of a reasonable length. It's like the dream D50 that Roland never built, so now Blue 2 can add Deluxe LA synthesis into the cross-fusion melting pot. One particularly helpful new feature is the ability to copy the settings of any oscillator to any other (or all of them). You can also swap their positions around if you wish, and choose whether or not to include the oscillators' ENV settings in the copy/swap function. The number of filter types for Blue's two serial/parallel filters has been upped from 13 to 28. New types include four 12dB, four 24dB, two 18dB, two 36dB, positive comb, negative comb, two-band formant and four-band formant (both with adjustable separation between bands). Both filters now have eight routing options owing to the greatly expanded Effects section, more on which elsewhere. The nine Envelopes that control the oscillators, filters and overall volume can be looped (aka envelope trigger) in tempo sync as before, but now the tempo sync of any of these envelopes can be defeated to run in free time. There is also the option to retrigger in an endless loop, or specify anything up to 32 repeats. An Amount slider controls the overall depth of envelope modulation. The four Multi-Envelopes (used as freely assignable modulation sources) remain as before, apart from some graphic shading to aid the placement of points on the tempo grid. New looping functions of the Modulation Sequence. In this example, Seq A initially plays 24 steps, then loops round steps five to 24.Four additional LFOs provide Pulse Width Modulation for the newly refurbished oscillators C to F, with a new Phase parameter on all 14 LFOs. This can be useful if, for example, two or more square wave oscillators' pulse widths are modulated by LFOs set to re-trigger their cycle on new notes. By offsetting the phase of each LFO, they start at different points in their cycles, producing a smoother, thicker sound. Settings can now also be copied and pasted from one LFO to any other. The Modulation Matrix remains essentially as before, with 20 slots available to modulate anything that can conceivably be modulated. The number of possible mod sources has risen from 36 to 75, and the number of destinations... well, to be honest there are now so many I didn't have the patience to count them! Two new modulation sources, Key Scale and Velocity Scale, offer freehand drawing of response curves. These can be used to create velocity crossfades and/or positional crossfades between different groups of oscillators, for example. Found amongst the many modulation sources in the Mod Matrix, the three Modulation Sequencers (formerly known as Step Sequencers) have been administered a shot in the arm too. Previously offering a maximum of 16 steps, they now go up to 32, with definable loop points. Their speeds are always sync'ed to the host DAW's tempo, with multipliers enabling playback up to 16 times faster or slower than the root speed. Mod Sequences can now be saved to disk to create a library of frequently used Mod Sequences that can be recalled whenever required. The Sequencer and Arpeggiator now have their own dedicated tabs, both with added definable loop regions and an extended +/- 16x speed range. The analogue-style 32-step Sequencer ups its game even further with the addition of a wave-sequencing page. In the same way that pitch, velocity and filter offsets are step programmed, each of the six oscillators can play a different waveform — including the sampled ones — on any desired step. Yes, it's Korg's classic Wavestation revisited, without the dodgy timing problems! My initial excitement was temporarily overshadowed by disappointment; the Sequencer only plays its patterns (and thus its wave sequences) monophonically, so it didn't appear to be possible to recreate those lovely, polyphonic rhythmic wave-sequences the Wavestation was renowned for. However, that disappointment vanished on discovering that the Modulation Matrix includes 'waveform type' amongst its destinations. It became obvious that a Mod Sequencer, rather than the Step Sequencer, could be used as a modulation source to jump between waveforms. Eureka! It worked beautifully. Even better is the fact that you can loop-retrigger a wave-sequenced oscillator's envelope, running at the same timebase as the Mod Sequencer, so each step has its own discreet envelope, something the Wavestation was unable to do. The only downside is that it's very tricky — if not impossible — to be specific about which waveforms are played by the Mod Sequence. It all depends on what the oscillator's base waveform is set to, the mod depth of each step, and the overall mod depth set in the Mod Matrix! The results are somewhat unpredictable, but it doesn't take much tweaking to end up with serendipitous results that sound great. Blue 2's most intriguing feature, the XY Modulation page is a modulation powerhouse that is far easier to grasp when you see it working than it is to describe concisely in print! Based on a four-corner vector system, it goes considerably further than simply mixing between oscillators, although of course it can do that if you want. The X-Y screen in edit mode, showing a previously recorded hand-drawn modulation pattern. The large blue dots each represent the positions of four notes played at different times — these move around while the pattern is playing back. Two vertical parameters and two horizontal parameters are being modulated.Let's start with that example: when the Vector Synth button is lit, the letters A, B, C and D appear in each corner of the large blue square, representing the first four oscillators (E and F are not affected). With the Off/Live button lit, playing a chord whilst moving the blue dot around the 'pad' with the mouse will morph between each oscillator. Doing the same with the Rec button lit records your mouse movements; you then hit the Play button, play again and your movements are pre-produced. When the Edit Position button is lit, your 'mouse track' is shown as a series of white lines and dots (you can edit the movement by clicking on any of the dots and repositioning them). The complete pattern can be tempo-sync'ed in a wide range of timebases. There's also a selection of pre-made circle, square, line and spiral patterns as starting points, with tools to scale, smooth, flip and rotate. If you prefer to use a joystick or X-Y controller pad to draw shapes, no problem; the X and Y parameters can be latched to MIDI controllers. The real fun starts, however, with the 16 vectorable modulation destinations. Arranged around the X-Y pad, there are eight knobs on the left and right for horizontal movement, and eight at the top and bottom for vertical movement. Clicking the blue box beneath each knob brings up all the possible modulation destinations — and like the Mod Matrix, it's a huge list. The knobs are bipolar, so the further away from the centre position they are, the deeper the modulation effect becomes as the X-Y dot moves towards them. Moving pictures and sound are worth more than a thousand words, so I recommend watching the Blue 2 Introduction video on Rob Papen's YouTube channel (www.youtube.com/user/robpapen). The section dealing with the X-Y page begins at around 7 minutes 35 seconds. Despite so many other soft synths having been developed since 2005, Blue's original version still holds its head up proudly as an incredibly versatile and musically inspirational synth. With this upgrade Blue 2 proves once again that it has an incredible amount to offer, and Rob Papen has to be commended not only for his superb enhancements, but for maintaining Blue 2's refreshingly clear layout that makes it easy and a pleasure to use. There's vanishingly little to criticise; the only issues I can cite are the inability to save custom Algorithm Matrices, and that directly 'latching' MIDI CC controllers to parameters is on a one parameter per controller basis. Fortunately, the Mod Matrix allows multiple parameters to be controlled by a single MIDI CC, nevertheless the RP team has taken this latter point on board. For those that are wondering, CPU use is surprisingly low, considering what's going on under the hood. Even on my old 32-bit Windows XP machine, the processors are barely ticking over. As Masterchef might put it, cross-fusion synthesis doesn't get better than this. There are plenty of virtual synths offering extensive modulation, exotic waveforms and lush effects. Many focus on a particular synthesis method such as subtractive, granular, additive or FM. Native Instruments' Massive, Absynth and FM8 are deep, complex synths that each address one or more of these methods. 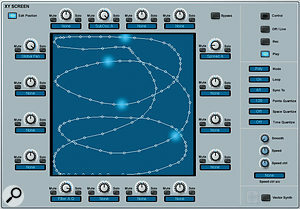 FXpansion's Cypher, part of their DCAM Synth Squad suite, has a TransMod feature which, like Blue 2, offers a vast array of modulation sources and destinations; it specialises in subtractive synthesis, it can do simple FM, and also provides various ways to control the shape of its waveforms. There are too many soft synths out there to list and compare, but if ease of use and versatility are the main considerations, then Blue 2 would appear to be unique in providing six-oscillator subtractive, FM, phase-distortion, wave-shaping, wave-sequencing and (arguably) LA synthesis all together. Thirty-two preset algorithms determine how the six oscillators interact, offering analogue and FM structures covering pretty much every useful combination. In the original Blue review, I commented that customisable algorithms would be useful, and indeed Blue 2 now includes an Algorithm Matrix, which enables any oscillator to modulate any other, including itself (aka Feedback on the DX7), and by any amount. Additionally, the 'raw' output of modulating oscillators (which would normally be inaudible) can be mixed back in to the signal for added texture or oomph. The one thing missing here is the means to save custom matrices, as anything you create here will be lost if you inadvertently return to the preset algorithm structures page. Blue 2's Effects section has literally doubled in size, with four effects slots each hosting almost twice the number of effects as before: 35 in all. As hinted earlier on, this adds further routing possibilities for the oscillators and filters. All four effects slots can be arranged either in a simple series or parallel configuration, or in one of six additional series/parallel variations. The permutations are highly flexible: for example, if two or more effects slots are arranged in series, any oscillator or filter can be routed to any point in the chain, ignoring the effect(s) in front and only being effected by the ones that follow. The 35 effects cover pretty much every type you can think of, and are all of top-notch quality, with special mention going to the new HQ Reverb. Perhaps unusually, the one effect conspicuous by its absence is Rotary — I suspect that if Rob Papen were to add one to the arsenal, it would be a cracker. Within each effects slot, two effects parameters can be modulated at once, either in real time with MIDI CCs or by Blue 2's own modulation sources. Multiple approaches to synthesis in one instrument. Endless modulation possibilities — these sounds really move! Ease of use and clarity of layout. Right-click 'MIDI Latching' restricted to one parameter per MIDI CC. No means of saving custom Algorithm Matrices. The original Blue combined analogue-style, FM, phase-distortion and wave-shaping synthesis in one powerful-sounding instrument with extensive modulation options and a very accessible user interface. Blue 2 represents a substantial upgrade, adding wave sequencing, X-Y vector modulation, a host of sampled waveforms, more filter types, a vastly expanded effects section, thousands of inspirational presets, and many more refinements. What was great is now quite simply stunning. £109. Upgrade from v1, £35.95. Prices include VAT. $179. Upgrade from version 1, $49.